I’m a big fan of soup, and not just because I get cold when the temperature drops below 70 degrees outside. The act of making soup invites creativity. It also allows you to clean out your fridge, feed a crowd, or feed yourself for multiple meals for very little money. 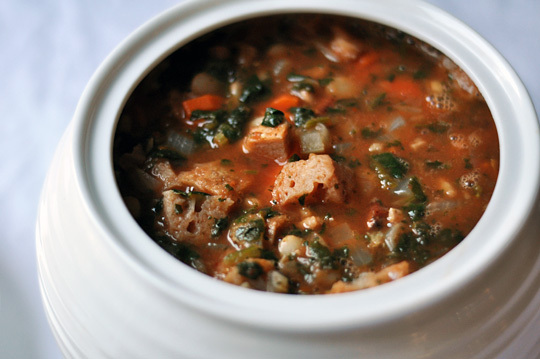 My boyfriend had told me about a soup he had eaten in Tuscany, called Ribollita (which means “reboiled” in Italian). Ribollita is a traditional peasant dish, and it holds up for the modern cook for three big reasons: it’s budget friendly, it’s filling, and it’s damn tasty. You’ll often hear Ribollita referred to as a “bread soup”, but bread is only one ingredient, and it’s not the star of the show. Ribollita features an ensemble cast of ingredients and flavors. It comes together pretty quickly, and it’ll keep you full for hours. As a bonus, it very easily can be a vegan dish, and it’s also Weight Watchers-friendly. I used one can of cannellini beans instead of 2. I didn’t have fresh basil on hand, so I used 2 teaspoons of the dried stuff. I used about 2 cups of canned chopped tomatoes in their juice, instead of the recommended 15 oz. Also, big note – this recipe yields 7 – 8 servings as a main dish. It keeps very well in the fridge & reheats well for a satisfying lunch. This entry was posted in Recipes and tagged beans, dinner, leftovers, lunch, mains, recipe, soup, tomatoes, tuscan, vegetables. Bookmark the permalink.